Creative working space and artisan coffee shop, Home of Honest Coffee, in the city of Salford, has taken one more step towards sustainability following the installation by Refarming Ltd & Co-operative and Mutual Solutions of one of HydroGarden’s VydroFarm vertical hydroponic systems in its basement. The system will be used to grow salad greens and herbs for use in its on-site kitchen. The initiative is the result of a new collaboration with local venture, Refarming Ltd and Co-operative and Mutual Solutions, and aims to bring food production closer to its consumers by working with ex-offenders during their rehabilitation process. It trains and supports them in the creation of micro-farms and the supply of nutritious produce so they are able to generate an income. Founder of Refarming Ltd and lecturer in Food Business Entrepreneurship at Manchester Metropolitan University, Jules Bagnoli, will be using the newly installed VydroFarm to carry out training, and hopes to install a further five systems in similar locations as part of an ongoing mentoring process. 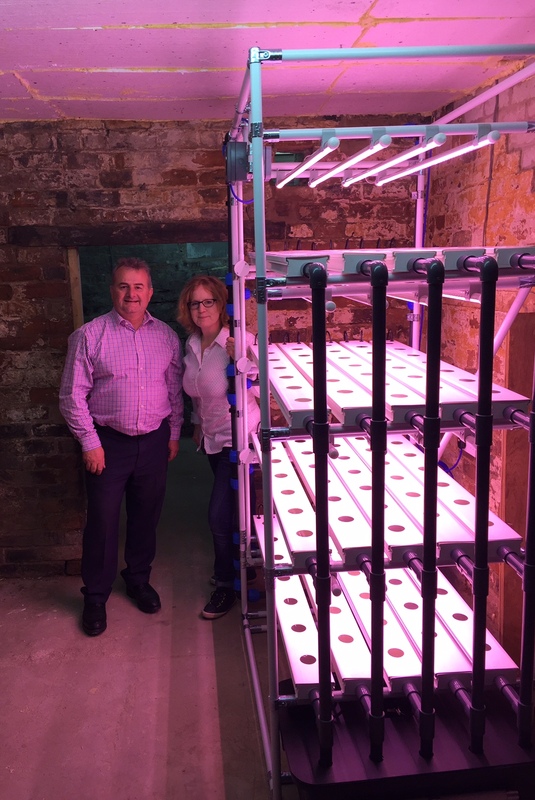 VydroFarm is the latest innovation from the UK’s leading hydroponics manufacturer, HydroGarden, based in Coventry. Each VydroFarm features vertical racks on tracks and is fully scalable, making them equally suitable for small scale production or for commercial growers requiring a large scale solution. VydroFarm offers a versatile and fully-controllable environmental system which can be pre-programmed according to the crop being grown removing the need for extensive technological expertise. The system can be remotely monitored and controlled via smart phone, tablet or PC. Optimum lighting conditions for crop growth are achieved with Valoya LED lights, reducing the growing time of a consistent crop of lettuce to just 28 days. Home of Honest Coffee opened in 2015 as the result of funding by 155 kickstarter backers and a grant from the Royal Society of Arts & Future Artists. The café offers locally sourced seasonal food and locally roasted coffee and prides itself on being a community asset as all profits go back to the local community as grants for creative entrepreneurs. Previous articleValoya drives Queen Mary University’s research into higher yields in agricultural crops in collaboration with Microsoft.